At Micrographics we want to simplify the implementation and use of CAD Design technologies for all of South African. Engineers and Architects want the best and most convenient solutions for their design challenges without breaking the bank or wasting time. Our uniquely diverse offering of Software, Hardware and Training services addresses every challenge faced today by the Engineering and Architectural industry. From concept to final project delivery, our consulting-driven approach strives to improve our clients’ business bottom lines. Consider your business future and whether you can afford not to partner with a company like ours. Our aim is to look after you and your company’s future! 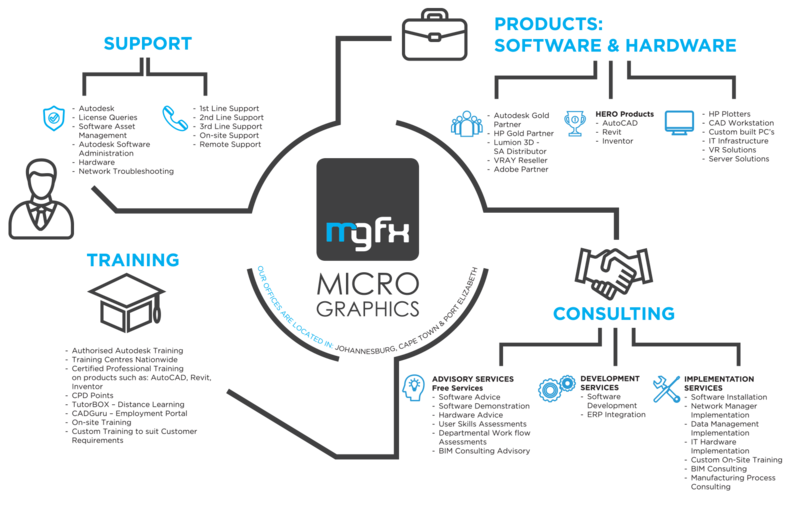 As an enthusiastic bunch of passionate individuals making up the team that is Micrographics, our strategy is to grow in the wake of our client base! Our aim is to improve either part of or address entire operational workflows. We thrive on assisting businesses to perform better. We pride ourselves on being the “idea station” that South African Engineering and Architectural companies can turn to. Our aim is to establish long-term relationships that are built around improving their bottom lines. The above all starts with the successful implementation of CAD Software and IT Hardware. Our passion for rapidly advancing technology expands into the IT Hardware space, retailing HP and DELL CAD Workstations. We also build component specified workstations to ensure optimum efficiency for all CAD Designers. From small to medium sized businesses our IT Departments is uniquely trained to equip Engineering and Architectural companies. We have a reliable IT Infrastructure that makes good business sense. One of our key focuses is “performance”, data management and to improve productivity in the IT environment. Our Specialisation with HP Large Format Printers (Plotters) further enables us to precisely understand our client requirements in the technical drawing space. Our proud Autodesk Reseller status with specialisations in Engineering, Manufacturing, Architecture and Construction gives us access to the world’s leading CAD Software. Our reach into a worldwide network of CAD Specialists further reinforces our powerhouse status. Our ability to develop and integrate software platforms and processes, with our customised software, substantially improves our client’s bottom line by reducing the overhead of performing routine and laborious tasks. This means our clients are able to redirect resources to activities that give them a positive edge in the marketplace. Some examples of these Automation tools include BOM Tools Pro, Duct Pro, Autodraw, SANSCalc and much more. Click here for more info on these tools: Inventor Tools and SANSCalc or contact us should you have unique challenges that require an advanced skill set to resolve. Our passion for the industries we operate in is highlighted by investments we’ve made into delivering solutions complimentary to our day to day operations. Consider our development of www.cadguru.co.za, a FREE intuitive based CAD Professional placement website, designed to assist companies and potential employees easily match skillsets with vacant posts in South Africa. Our development of www.trackerpro.co.za is designed to assist small to medium sized Architectural (and other project-based companies) track operational activities and costs. We want our clients to focus on what they do best, and not get bogged down with tasks that we are here to cater for. This ensures a maximum net sum gain for everyone. A good example of this would be our strength in implementing Autodesk Vault PRO, in conjunction with Autodesk Inventor design software into Manufacturing businesses. Where turnkey manufacturing, sales, marketing, design and shop floor fabrication elements require total integration, you can rely on Micrographics to get the job done! On the AEC side, when Building Information Modelling (or BIM) integration is required in Architectural or Engineering Consulting firms, we facilitate bringing together design models from multiple disciplines. This ensures coordination, review, project management and finally delivery in the most accurate and cost-effective way. We provide honed and experienced formal and customised training. We will train up on AutoCAD, Revit, Inventor, Lumion and many other Autodesk based CAD Software platforms via Autodesk Accredited Training Facilities around South Africa. And to ensure maximised benefit to our clients, our CAD Consulting services are always available to further advice and provide integration support where necessary. We endeavour to partner with our clients for life. This ensures a consistent approach to our clients’ technological needs. And maximises their opportunity to achieve greater productivity and profitability over time using “fit for purpose” solutions. Should you feel the need to consolidate your technological approach to your business, we encourage you to give us a call for some of the best advice to be found in the CAD Industry.